September 21 was National "Thank a Police Officer" Day. I just learned that little fact today. So, rather than wait another three hundred and fifty-six days (and probably miss it again), I'm declaring today Megan's "Thank a Police Officer" Day. The "thin blue line" is a nationally recognized symbol of support for the brave men and women in law enforcement. Many thanks to "J," who specially requested this design and inspired me to add it to my shop permanently! 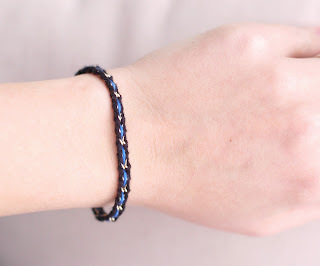 After doing some research, I have confirmed that there's a solid selection of chunky para-cord bracelets, but very few pretty or elegant options out there. This bracelet would make the perfect gift for the wife, mom or daughter of an officer (or maybe a bridesmaid's gift at your police wedding)! And this bracelet is made from recycled vintage chain, eco-friendly, yay! 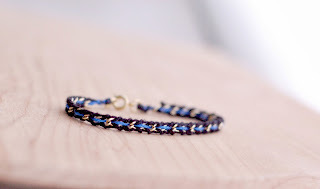 This bracelet would also make a good gift for a female police officer. There are many women directly in law enforcement, not just the wife or mother of a male officer.